When planning a new trip, all you can think about is the perfect, relaxing time that you will spend visiting the new destination. You will be taking hundreds of pictures, you will finally forget about work and your daily tiring routine and you will get to put on your best outfits. There is only one word that can describe this: perfection. Except, beauty is often found in the small details, as is relaxation. If you want to have a beautiful time during your trips, you must think of all the details, including the bag that you will be carrying with you. Is it roomy, sturdy, fashionable enough? Is it going to be practical? Will it be secure enough to protect you from thieves when visiting crowded places? These are aspects that you should take into consideration if you want to feel completely safe. Cross-body bags for travel are usually well constructed, they have plenty of pockets and RFID protection that prevents identity theft. They are highly practical and can be fashionable, too, depending on the model that you choose. The best cross-body bags for travel are brought to the market by specialized manufacturers that know exactly what you need to find in such a product. These bags come in a variety of colors that you can choose from, so you don’t have to worry about the outfit combinations that you are already planning. The great thing about the best cross-body bags for travel is that they have a lot of pockets and compartments which help you organize your stuff and find everything easily. Are you looking to buy a cross-body bag for your future travels? Then you have come to the right place. We have analyzed and reviewed five of the best-selling such products on the market and highlighted their pros and cons. Take a look at the five products below and see which one is best for your needs. If you are planning a trip and you want a bag that helps you feel safe, then you might like this product more than expected. 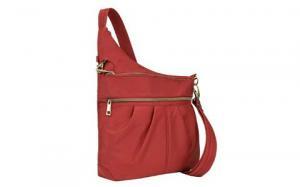 It has a nice design, practical pockets and a sturdy shoulder strap that makes it comfortable to wear. Do you like your bags to be adjustable and roomy? This cross-body bag is incredibly practical, as it comes with a main locking compartment, as well as an organization compartment where you can safely store your documents, such as ID, passport or anything else that contains personal information. Thanks to the RFID blocking card, you are protected from identity theft when wearing this bag. Its strap is adjustable and resistant, so no matter how heavy you bag becomes from storing all kinds of souvenirs, it will not let you down in the middle of your walk through your favorite destination. Also, it has a front slash pocket, a rear pocket and an LED light that proves to be helpful in dark places or during the night, when all you want to do is to find your keys or phone quickly. More than that, it comes with two expansion pockets for your water bottle and umbrella. It is made of polyester and you can choose from 24 color options, depending on your preferences. This travel bag is ideal for those who like sport casual outfits and who want to protect their valuable belongings during their trips. This cross-body travel bag is ideal for men and women who don’t like to carry a lot of objects with them while strolling, but they still want to protect themselves from identity theft. If you are one of those who like to take the minimum necessary with them when stepping out of the hotel, then this bag is perfect for you. It goes perfectly with casual outfits and has adjustable straps that prove to be very practical. This product is compact and lightweight, it has a main compartment that is quite roomy and that is equipped with an RFID blocking card. It has a passport slot that helps you stay organized and reach your documents quickly when needed. Also, it has a top pocket and a mesh pocket that are zippered and a front and rear pocket that can be used to store your phone or other electronic device. If you are generally annoyed by the fact that you can never find your stuff especially during the evening, you will be glad to know that this bag includes an LED light that will ease the search. This bag measures 6.5 x 1.25 x 9 inches and weighs 6.4 ounces. It is slim, yet it fits your laptop or tablet, that will be carried safely thanks to its sturdy construction. The strap is approximately 50 inches long when fully extended, so it fits any body size. Are you into vintage design and you would like to own a practical bag with you when traveling? 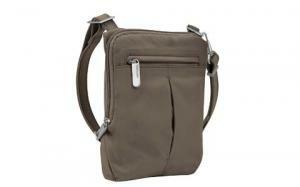 Then you might like this cross-body bag that comes in 8 colors and that is suitable for both men and women. It has an interesting design, with a large zippered compartment where you can keep various objects, as well as documents. This compartment includes an RFID blocking layer, so you will not have to worry about the security of your documents. It also has 2 open top wall pockets and a rear zipping one. Its 9.75 x 7.75 x 2.25 inches size is suitable for those who are looking for a medium-sized bag. The length of the strap can be adjusted between 13 and 25 inches. This bag is made of a very thick canvas material that you could find practical, giving the fact that you can wear it throughout the year. It has built in card slots and a larger interior slot where you can store your phone. It is large enough to fit a tablet, a portable monitor, a portable dvd player or a small laptop, so if you like to have your electronic devices with you all the time, this bag will allow you to. It is great for traveling, as it is comfortable to wear and practical. It comes with an LED light that can be used whenever you don’t have enough natural light to find your stuff. Are you looking for a feminine cross-body bag that is practical and fits all your fashionable outfits, too? This travel bag from Travelon meets all your requirements. It is fairly priced, it comes in 14 different colors and it has just enough compartments to help you carry everything that you need with you. It comes with 3 compartments that are zippered and prevent thieves from stealing your stuff in crowded places and a main compartment that has an RFID blocking card, which also protects you against identity theft. It is sturdily made, it has a great construction and it has an adjustable strap. Also, it has a rear zipped pocket and a passport slots that you can use for your documents or your phone. If you are concerned about the safety of your belongings and you want to make sure that you choose the most secure cross-body bag for travel, then you will be glad to know that its body panels are slash-proof. This product measures 3 x 13.8 x 11.5 inches and weighs approximately 11 pounds, so you can take with you even large objects such as a tablet or a book. If you are pretentious when it comes to your accessories, this could be the ideal product for your needs. However, it was designed for women only. 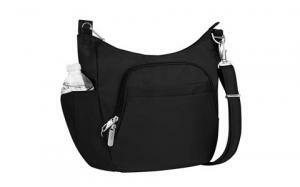 If the previous product was designed for women only, this one can be worn by both men and women, but it is rather a masculine cross-bag that can be used for traveling. It is a versatile model that has a great design and can be used for a variety of purposes. 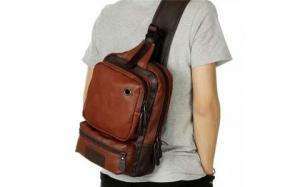 It is made of soft leather, it is waterproof and it is comfortable to wear, as it is just like a back-pack. It comes with a padded strap, unlike any other product in our list. Thanks to this feature, it does not hurt the shoulder or the skin, no matter how heavy it gets. The great thing about this product is that it is made of leather and it can be worn even with the most pretentious outfits. This bag has a main compartment that fits a tablet or a laptop. It has two large pockets on the outer side, with zipper closure and just enough space to keep small objects like your keys or your phone and larger objects like a book, a wallet and more. If you like listening to music while strolling, you will be happy to know that this bag has a headphone hole design that provides easy access to the earphone. It comes in blue, brown and navy and it is highly practical. The shoulder strap is adjustable and wide, so you will find it very comfortable to wear and maneuver. If you want a bag that offers value for money, then this might be your best option. Are cross-body bags more practical for traveling than regular purses? Having a bag that can be used for multiple purposes, that is fashionable and comfortable to wear is essential these days. Both men and women want to buy items that are as practical as possible and look good at the same time. It is important to be able to dress in any way that you want and simply grab your bag or purse without having to think about matching the outfit with it every single time. Cross-body bags for travel are the ideal accessories that you can buy if you feel that this is the case for you. A cross-body bag can be found in a variety of sizes, shapes and materials. The most popular models are made of leather and waterproof materials. Users love them because they make accessing personal items very easy, they allow them to move freely and make them feel secure. More than that, they are especially designed for travelers, with plenty of pockets and compartments, without looking bulky. What are the features of a good cross-body bag for travel? 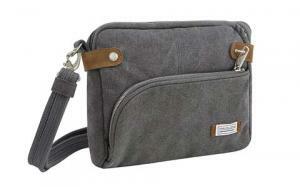 A high-quality cross-body bag for travel has to be made of durable materials. Not only the body of the bag or purse is important, but also the strap. Sometimes, when traveling, we tend to take a lot of personal items with us, so the bag can become heavier than expected. Therefore, it needs sturdy straps, made of leather or another durable material. Having adjustable straps is a must, as you might want to wear it in different ways. If it is a zippered bag, the zippers must also be high-quality, or they will break easily and you will end up worrying about your stuff the whole time. Having enough room is also very important. So how can you find a cross-body bag that is roomy and still looks attractive? Actually, this is the manufacturer’s job and most of the top sellers have ensured that you get both the advantages when paying for a good travel bag. Another essential feature is the utility of the bag. Make sure that you try it on and see if it is easy to switch, if the strap tends to fall of your shoulder and if it is comfortable to wear. Are all cross-body bags for travel sporty? Although the first thing that comes to mind when thinking about a cross-body bag for travel is a sporty messenger bag, that isn’t always the case. In reality, travel bag manufacturers focus on designing these products in such a way that they are fashionable, too. If you go for a leather cross-body bag, for instance, you will be able to combine it with all sorts of outfits, from casual, to business. If you have a more athletic style, then you can find sporty cross-body bags that fit your clothing, but you cannot be sure that it will match your other outfits. Traveling is probably one of the most important things that you can do to fulfill your life and create memories that last. Make the most of it and stay safe during your travels, by investing in accessories that help you get rid of the smallest of your worries. Buy one of the best cross-body bags for travel that you can find. Get inspiration from the five products in our list, analyze their pros and cons and choose the one that fulfills all your requirements. You still cannot decide? Think about the priorities that you have during your travels and try to make a list of objects that you know you cannot travel without. This way, you will get an idea about the most important features that you need in a travel bag. Do you carry a lot of devices, documents and useful objects, or you are a minimalist who only needs the ID, wallet, phone and charger? Choose a larger, roomier bag with practical compartments if you find yourself in the first description, or a small, comfortable to wear bag if you think that the second case applies. Either way, don’t forget to choose something that fits your style and personality.